The fight for the living room is heating up with Apple recently upping the ante with the reboot of the Apple TV and telecommunications giant, Telstra, making moves of its own with the release of the Roku powered Telstra TV. Now there’s another contender vying for the space underneath your television and it’s by far and away the most technologically advanced device of the bunch - the Nvidia Shield. Powered by Google’s Android TV platform, the Shield comes future proofed for 4K content delivery while also offering a gaming experience unlike anything else on the market, all for roughly the same price as the new Apple TV. So should Australians bite the bullet and import one? The Nvidia Shield is a striking mix of sharp angles and criss-crossing lines that is a refreshing departure from the hockey puck design we’ve become accustomed to seeing from other media streamers. Measuring in at 25 x 210 x 130mm (H x L x D), it is a rectangular slab that is about double the length of the new Apple TV but maintains a much thinner profile overall. Imagine the size of the thin novel. The default orientation is horizontal, however, you have the option of sitting the unit vertically with the optional matching stand. The angular design is complemented by an alternating glossy and matt-black finish complete with a subtle green LED light strip serving as the power indicator. There are no physical buttons on the unit itself with the Nvidia logo acting as a touch sensitive surface for turning the unit on/off. We would have preferred a physical backlit power button as the touch sensitivity was a bit temperamental especially when attempting to turn the unit off and we also accidentally hit the power button more than once. Around back is a healthy smattering of ports including HDMI 2.0 with HDCP 2.2 capable of outputting 4K content at up to 60fps, Gigabit ethernet, 2x USB 3.0 ports for connecting peripherals and USB drives, micro-USB port and a micro-SD card slot for expanding the 16GB of internal storage. Rounding out the package is an infrared port which means that you can use a universal remote like the Logitech Harmony to control the Shield. The Shield comes with a game controller and a remote in the box. The Shield controller is essentially a slightly bigger version of the XBOX 360 controller with near identical button mapping and layout. It’s a well-built controller and the familiar feel means that most will be able to pick it up and start playing. There’s also a volume rocker, a touchpad and a built-in rechargeable battery that, in our testing, lasted longer off a single charge than even the PS4 or XBOX One controller. In addition, the Shield controller connects over Wi-Fi Direct making latency virtually non-existent. For non-gaming tasks there’s the remote which is equally well-built and a bit taller in size than the Apple TV’s remote. Both the controller and remote sport a headphone jack for private listening and there’s also support for wireless headphones via the Shield’s in-built Bluetooth. What’s more, you can use the onboard mic for voice controls. The battery life was once again impressive - we’ve had the Nvidia Shield for a little over two months and in that time we’ve only had to charge the remote once. The great thing about the Shield and the open nature of Android TV is the ability to connect virtually any USB or Bluetooth enabled keyboard, mouse or game controller. Even Microsoft’s XBOX 360 controllers will work wirelessly on the Shield while PS4 controllers can be used over a wired USB connection. The wide compatibility list makes setting up a local couch-based multiplayer session a breeze. Inside, the Shield packs some serious silicon. A Tegra X1 processor with a 256-core Maxwell GPU and an eight core 64-bit ARM CPU coupled with 3GB of super-fast DDR4 RAM make the Shield the most powerful set-top box to date. All that power under the hood translates to a fast and stutter free software experience where apps and menus load without delay and demanding 4K videos playback without any buffering issues. We put the Shield through its paces by loading up a HEVC 4K video file encoded at an extremely high bit rate of 50mbps and it ran with no problem at all. Shield is also the only media-streamer on the market to support passthrough for lossless audio such as DTS-HD and Dolby TrueHD. To test this feature, we played some Blu-ray backups stored on our NAS and it all played flawlessly with full 7.1 HD audio blasting through our home theatre setup. For those who roll their own media, the Nvidia Shield can’t be beat. Kodi is available for download on the Play Store while a full version of Plex is included in the box. And if you’re go-to video streaming services are Netflix and YouTube, then the Shield is one of the few devices on the market that can display 4K content from both those services. If you also use geo-dodging to access American services like HBO Now and Hulu, the Shield delivers on that front too. But as the Shield isn’t officially available in Australia, don’t expect to find any of the local on-demand options like Stan or Presto or catchup services from any of the major networks. It does, however, have Chromecast built-in so you can stream a lot of that content from your smartphone or tablet to the Shield. It’s also worth mentioning that some of the native apps available on Android TV aren’t as full featured or polished as the Apple TV versions. For instance, in the NBA app there’s no option to watch a condensed version of a match and live games are accompanied by grey borders. While the fourth generation Apple TV offers a wide array of apps from AirBnB, Zova personal training to shopping experiences like Gilt, Android TV’s app library is limited to games and entertainment. This may change over time as the platform matures and the install base grows but there’s no guarantee that it will ever catch up with the app selection available on Apple’s platform. Android TV also lacks the ability to bounce between recently opened apps which is a shame given the more than ample processing power available under the hood of the Shield. Multitasking between multiple apps is something we’ve become accustomed to doing on the new Apple TV and it’s absence on the Shield is definitely felt. We noticed a few other minor issues on the software front. The HDMI-Control feature which is designed to turn on and switch all connected devices like the television and AVR to the correct input was hit and miss while the YouTube app refused to play content at 60fps. You also can’t use voice search in third party apps like Netflix. Hopefully these issues get ironed out with a future software update. Of course, games are where all that processing power gets put to good use and the Shield offers a number of different options for our favourite pastime. You can either use the Google Play Store to download controller-friendly Android games, stream games you already own from your PC to the living room via GameStream or play the latest PC games beamed from the cloud with a Netflix style subscription service called GeForce Now. In the Play Store you’ll find popular casual titles like Pac-Man CE, Crossy Road, Rayman Fiesta Run to deeper classics like Titan Souls, Soulcalibur, GTA Chinatown Wars and Final Fantasy VI. However, a large majority of controller enabled Android titles are simply not available to download from the Play Store. Titles like GTA San Andreas and Sonic for example aren’t available on the platform as they haven’t been flagged as ‘Shield compatible’ even though they would run perfectly fine. You can get around this issue by side-loading the apps to the Shield which is what we ended up doing, but the involved process is likely to put off most from even trying. To make up for this, Nvidia has partnered up with select game studios to bring more advanced titles exclusively to the Shield. This means that popular titles from the last generation of consoles such as Doom 3 BFG Edition, Trine 2, the entire Half Life series (including Episode 1 and 2), Portal, Hotline Miami 2, Metal Gear Rising: Revengeance and Tales from the Borderlands are all available to play with more big name titles like Resident Evil 5 on the way. It’s quite incredible to see a set-top box run a game like Doom 3 flawlessly at 1080p/60fps with superior visuals and performance than its console counterpart. There are a few exceptions such as Metal Gear Rising which falls short of the console version but still offers up a good enough experience. The other really interesting thing on the Play Store is emulators and thanks to the X1’s graphics and CPU chops, we were able to relive classic games from the NES through to the Gamecube and even Playstation Portable (PSP). Barring a few exceptions, all the games played at higher frame rates and at a much high resolution than their original versions. Titles from the PSP catalogue performed particularly well and looked great when scaled up to the big screen. Shield is also fully armed and operational for in-home game streaming from your PC so you can play the latest PC titles on your living room television without the hassle of having to physically move your rig from your desk. Provided both your PC and Nvidia Shield are connected to your home network via a wired connection, the results are impressive. Games streamed at 1080p/60fps on a consistent basis with only the occasional drop in frames in titles like the Witcher III and Mad Max. For the best experience, you’re going to need to be running a pretty powerful Nvidia graphics card on the host PC. The only real downside to GameStream is that the compatibility list contains fewer than 300 entries. In comparison, Valve’s SteamLink dongle which retails for around $100 offers a much larger library of compatible streaming titles. If that wasn’t enough gaming for you then there’s Nvidia’s Netflix for games style service - GeForce Now. For a monthly subscription fee of $US9.99, you can stream a library of PC games from the cloud right to the Shield. Unfortunately, the service is currently only available in the USA and Europe. 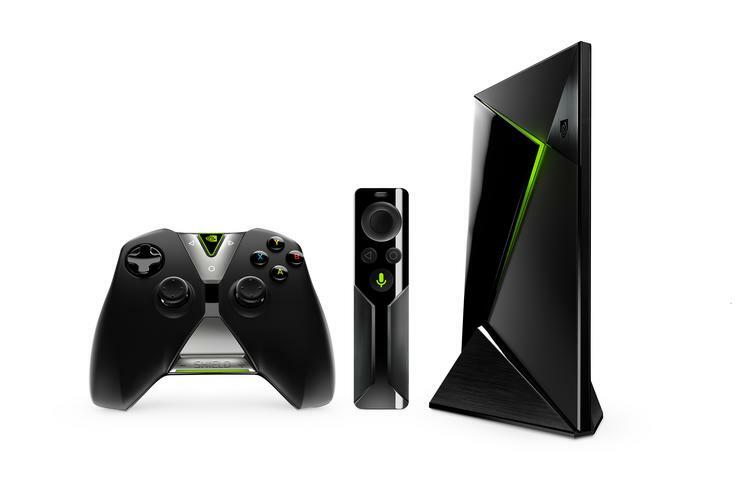 Nvidia’s sleek black box is easily the best Android TV device on the market. At roughly the same price as the new Apple TV ($US199/$A276), the Shield offers a great deal of power for the money but it’s not for everyone. If you want to get the most out of your 4K television and desire a powerful media player capable of playing anything you throw at it, the Shield is hands down the best option on the market. Similarly, the Shield has something to offer those who mightn’t already own a dedicated games console. Nvidia’s micro-console offers a viable entry point particularly if you don’t want to fork out $70-$80 for the latest blockbuster title while seasoned PC gamers will enjoy the ability to seamlessly shuffle their games to the living room with GameStream. If on the other hand you’re not interested in games or 4K content and simply desire a box on the cheap with the most media streaming services, than you will be better served with the Telstra TV or the last generation Apple TV.